I bought this 3 Chervonetsev note (30 rubles) at a flea market in Tbilisi the hawks Soviet stuff back in October. In any part of the world conquered by Lenin’s unflinching ideology, you can’t seem to get away from him. This reddened visage was staring up at me from a blanket on the sidewalk and I scooped it up from the vendor for 5 lari (about €2). This was issued in 1937 following the 1936 constitution ushered in by Stalin and at the height of regime infighting known as the Great Purge or Great Terror. This banknote is likely commemorating the 20th anniversary of the October Revolution of 1917. New York- When news broke on December 8 of organized protestors toppling a Lenin statue in Kiev, after pro-Moscow (generally speaking) President Viktor Yanukovych abandoned the EU Association Agreement in what is believed to have been under Kremlin pressure at the recent EU summit in Vilnius, Lithuania, some people were surprised that some 22 years after the Soviet collapse a Lenin would still be standing in Kiev in 2013. Disenfranchised Ukrainians subsequently took to the streets in protest to demand more integration with the EU, cooling of ties with Russia, and that President Yanukovych step down. Many in western Ukraine do not want their country to forever be an economic vassal state to suzerain Moscow. Even if that Lenin had stood still after 1991, one might think that after the 2004 Orange Revolution (Помаранчева революція) that any works of Soviet socialist realist art would have been eradicated in Ukraine but not so. Nor in many other places in formerly Soviet lands. So pervasive is Lenin’s stoic gaze that he may show up just when you think he’s gone. In June 2010 when I was reporting on the anti-Uzbek pogrom in Osh, Kyrgyzstan there stood a massive Lenin statue untouched in a square outside the city’s main ministry building (where I was meant to get a journo accreditation but never did when I felt it was too convoluted a process). As this blog somewhat humorously shows, Lenin statues, many of them quite sizable, are still found throughout the post-Soviet space. Lenin and his much more horrifying successor Stalin–like Mao in today’s China–are at nowhere near the level of vilification as Hitler, though it is commonly believed that many more were killed in Stalin’s USSR and Mao’s PRC than the parts of Europe in the relatively brief throes of Hitlerism. Stalin’s and Mao’s respective rules each lasted for several decades. Though of course the adulation of Lenin, Stalin and Mao has been greatly toned down over the years, their bitter legacies are still felt in much of Eurasia today. Case in point: I was reading a recent article in Outside Magazine (“The Sochi Olympics Are a Five-Ring Mess”) about the upcoming Winter Games and it featured an image of Stalin’s dacha in Krasnodar krai with a wax figure of “The man of steel” sitting at the desk of one of his favorite retreats. So the Winter Olympics will be held in place where Stalin is insufficiently demonized I suppose. Can one imagine going to Berlin or Obersalzberg today and seeing a dull wax figure of the author of Mein Kampf being passively celebrated? And in the lead up to a major international sporting event no less? When I visited Gori in central Georgia in 2009 (see the post “Hollywood Comes to Gori“) as the Finnish director Renny Harlin was recreating the August 2008 war that occurred barely a year earlier, there stood a giant statue of Stalin in Gori’s main square as a backdrop of Harlin’s abysmal flop Five Days of War. Mikheil Saakashvili tore down the above statue of the hideous Soviet dictator in Gori in 2010 but others in Georgia are defiantly planning on re-errecting it, partly to humiliate the former president and partly to perhaps bring in tourist dollars via a depressing attraction. It’s just hard to shake some of these guys. They are so 20th century. The back face of the 3 Chervonetsev bill which names the note in Russian, Ukrainian, Georgian, Armenian, and various other languages still in Latin script at the time of minting. In the wake of the fall of the Lenin statue in Kiev, I randomly met a young guy from Tiraspol, the capitol of the unrecognized Republic of Trans-Dniester (which broke away from Moldova during and after the Soviet collapse) the other week. 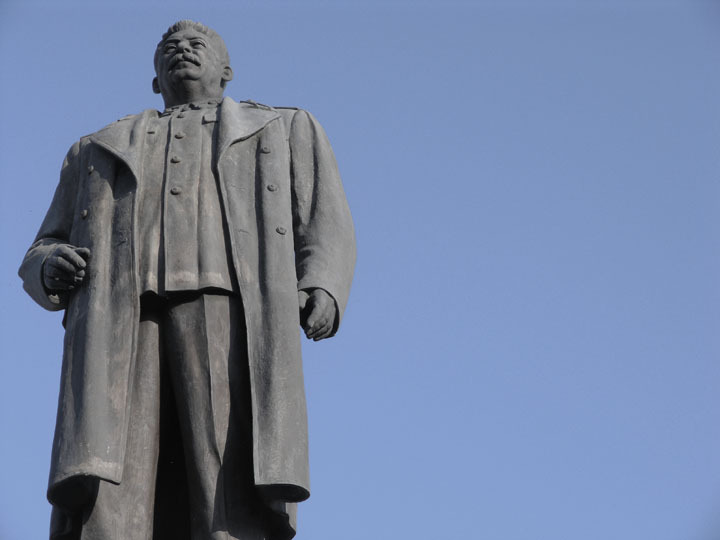 Of course for those who know just a shred about Tiraspol and its retrograde Lenin-idolatry regime, then you know that there is a heck of a big Lenin statue there today in front of the parliament building in the city’s main square. I asked him not only how he got to the United States, but how he left Trans-Dniester with a passport not even accepted by the Russians as Trans-Dniester is only recognized by the mostly un-reocgnized Abkhazia, South Ossetia and Nagorno-Karabagh in the South Caucasus. He told me that as an ethnic Ukrainian he was able to obtain citizenship in that country as well as a passport valid for international travel and that the Black Sea port of Odessa with its international airport is the lifeline for young Trans-Dinistrians trying to leave their ideologically anachronistic mini state. 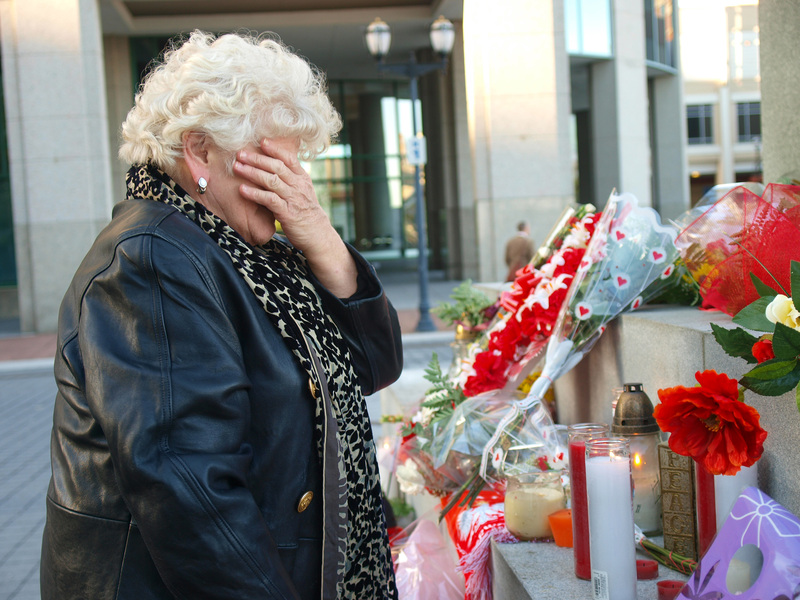 “Everyone needs either a Russian or Ukrainian passport to get out. And our airport is only for military flights so we have to travel by land to Ukraine to leave” he told me. Not much is really understood about this very obscure, very non-EU corner of Europe but for years Trans-Dniester has been said to be a source point for both arms and human trafficking in the Black Sea region. After I mentioned that he was the first Trans-Dnistrian I’d ever met in the U.S., he smilingly replied “and you’re the first person here who has ever heard of my country and our capital.” In Ukraine the Euromaindan protests go on, but in neighboring Tiraspol all is quiet on the pseudo-Soviet front. Russia may have military footholds in Moldova and Georgia’s breakaway regions, but at least Chișinău and Tbilisi will be able to sign EU Asssociation Agreements of their own free will. 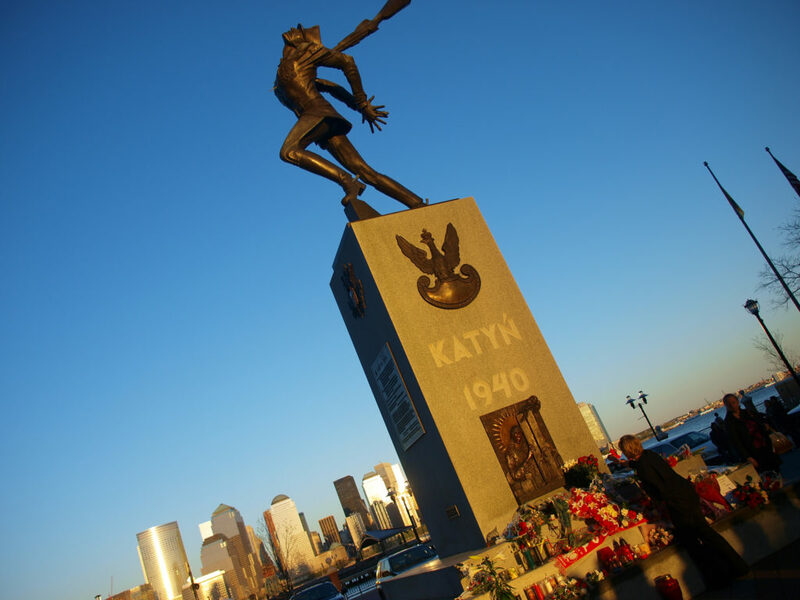 New York- Many people who are not Poles or who lives outside of the western post-Soviet space were not previously aware of the Katyn forest massacre in the context of Russian-Polish relations. I myself used to know nothing about this Stalinist tragedy in the midst of the second World War until about five years ago when I happened upon a massive, dramatic bronze sculpture in Jersey City, New Jersey, directly across the Hudson River from lower Manhattan. The statue is dedicated to the Polish officer corps and soldiers who were slaughtered on orders of then NKVD (predecessor of the KGB-now FSB) Lavrentiy Beria, Stalin’s number two enforcer. Beria, a perennially cruel Mingrelian thug from Abkhazia, engineered the decimation of Poland’s military leadership. On April 10, Poland’s current president Lech Kaczynski was flying to the Smolensk Air Base in western Russia for the 70th anniversary of the massacre to honor Poland’s martyrs from April 3rd, 1940 when his plane went down in this same cursed forest. 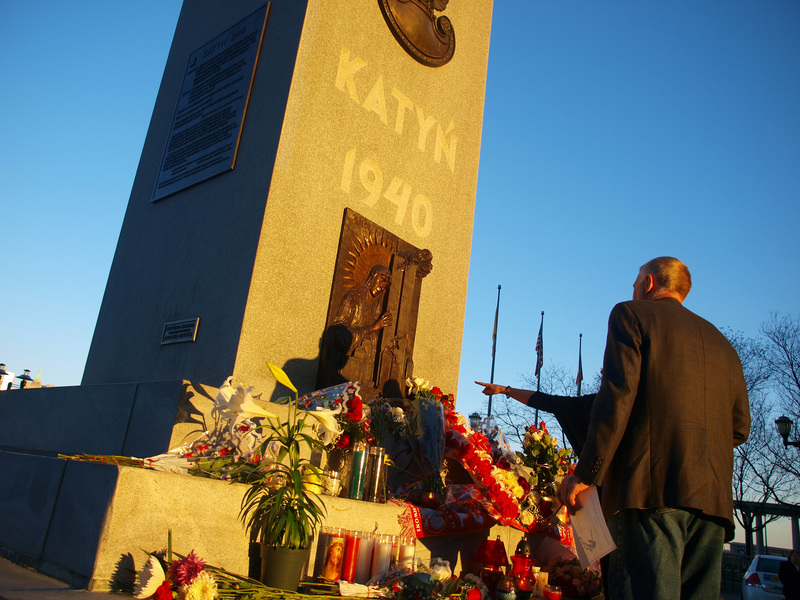 After it had been reported that all aboard were killed, I knew there would be a vigil of New Jersey and New York-area Poles at the Katyn Memorial. 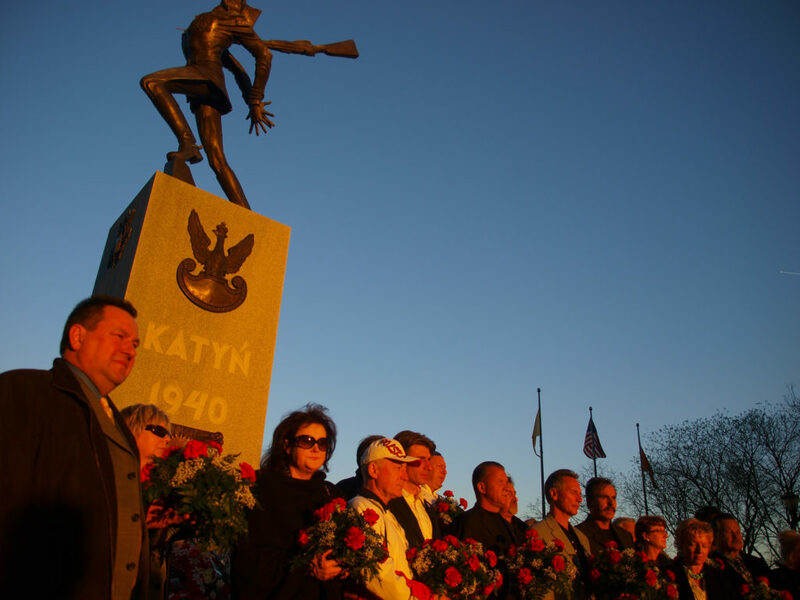 New York-area Poles gather on the evening of April 10, 2010 at the Katyn forest massacre monument in Jersey City by sculptor Andrzej Pitynski after the death of Polish president Lech Kaczynski in a plane crash in Smolensk Russia while he was en route to commemorate the 70th anniversary of the massacre of Polish soldiers by Joseph Stalin and Lavrentiy Beria. 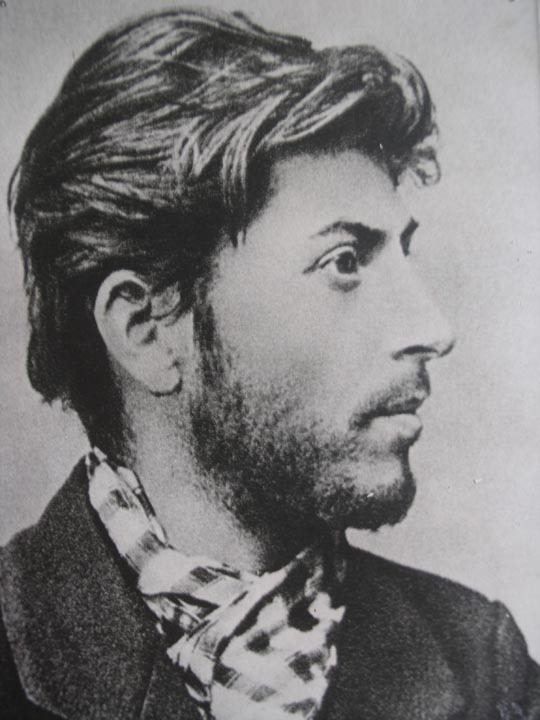 Profile portrait of Stalin as a young Bolshevik after his arrest in the Stalin museum in Gori, Georgia. Gori, Georgia- This photo hangs in a museum that has not been updated since it opened thirty years ago at the twilight of the Brezhnev era. It is the B-side to the photo on the cover of Simon Sebag Montefiore’s Young Stalin. There has been a rather sizable reported uptick in revisionist pro-Stalin sentiment in Russia as of late and the BBC is reporting that this may create a small crack in Moscow’s otherwise unrepentant leadership. Does it get much more twisted kitsch than this? 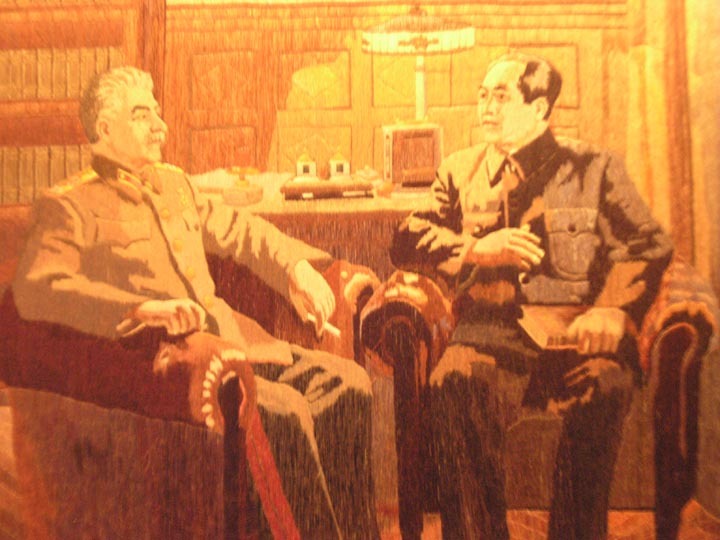 Stalin having a smoke and chilling with Mao.